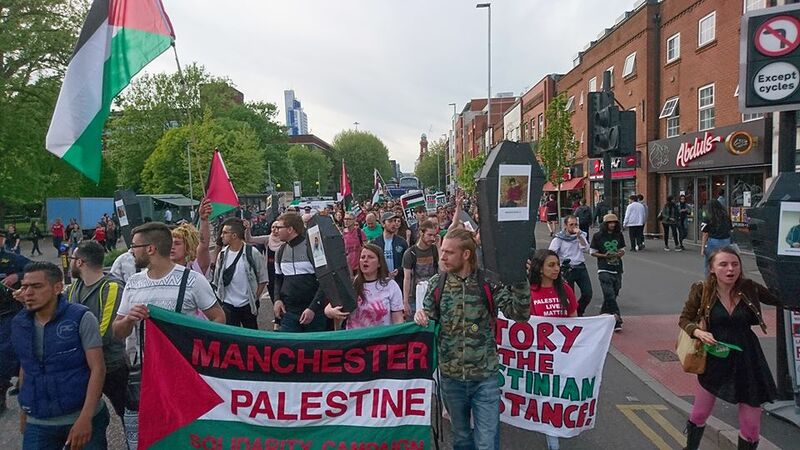 The high street bank HSBC’s investments in the arms trade came back to haunt them on Tuesday when pro-Palestinian activists occupied their branch in St Ann’s Square, Manchester, chanting: “your profits are covered in Palestinian blood”. 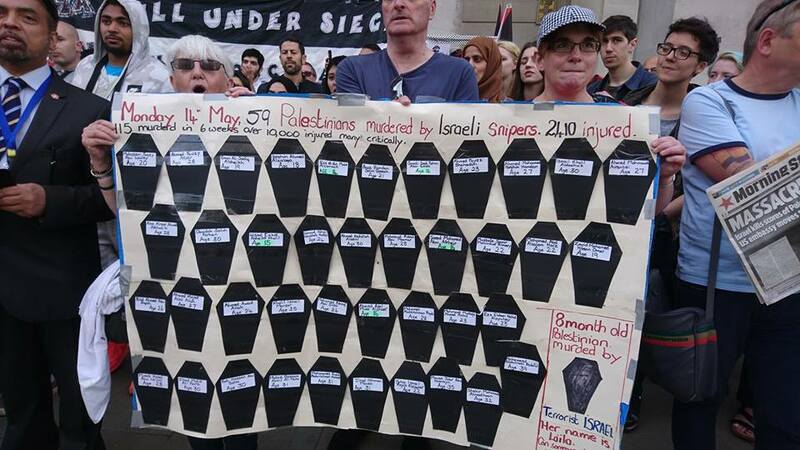 The activists lay on the floor alongside child-size coffins to represent the multitude of Palestinians killed and injured over the pst 70 years, including 58 just the previous day killed by Israeli sniper fire. These events represent an ongoing humanitarian disaster for the Palestinian people, exacerbated by the US president’s decision to move the US Embassy to Jerusalem. 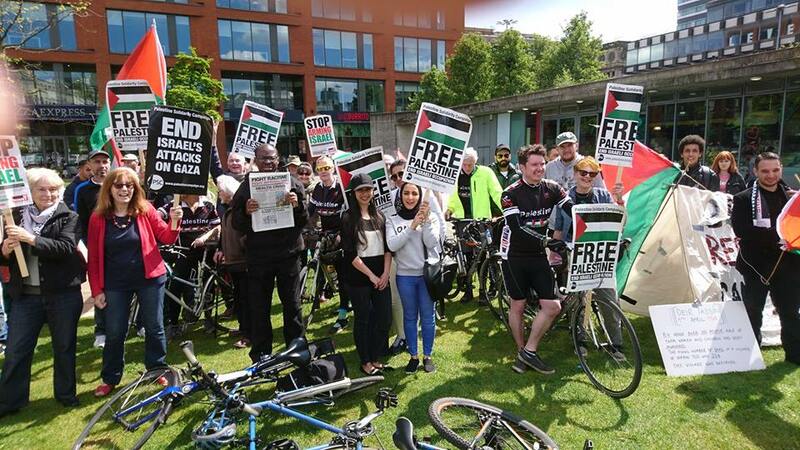 It is the investments by HSBC into Elbit Systems, Israel’s largest publicly traded arms and security company, and other arms traders that concern the members of Manchester Palestine Action (MPA), who occupied the bank. Elbit produces 85% of drones (Unmanned Aerial Vehicles, UAV) used by the Israeli army, including the Hermes 450 and 900 drones which Israeli forces can equip with two air to ground missiles, or targeting systems to mark a target for other aircraft to attack. Amnesty International reported, in 2009, that Israeli drones were identified as taking part in attacks that killed Palestinian civilians in Gaza. UAV Engines is a subsidiary of Elbit Systems, with a factory in the UK, that manufactures engines for the Hermes range of drones. There have been repeated calls from MPA and Amnesty International for the suspension of all military exports to Israel. These calls have been rejected by the UK government. 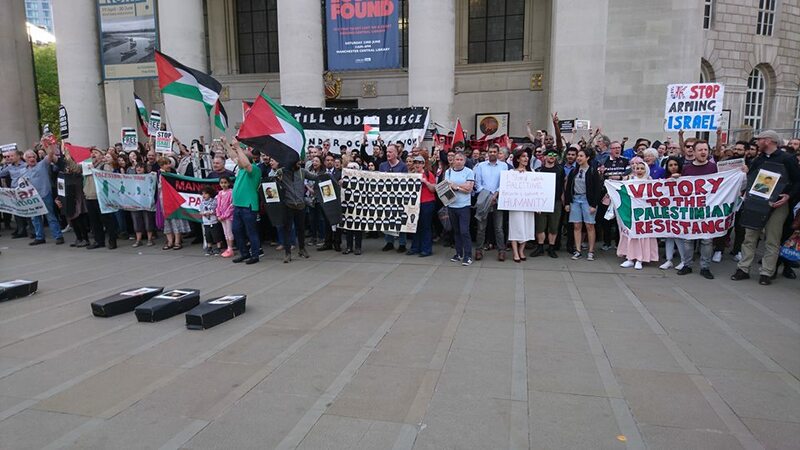 After their peaceful demonstration inside the bank, the MPA members stood outside, where Adie Mormech spoke powerfully, explaining that the Palestinian people need help more than ever, with the attacks of the Israeli army leaving 58 dead and over 1,200 wounded the previous day, 15 May 2018, the 70th commemoration year of Al Nakba. ‘Also known as The Catastrophe’, Al Nakba was the beginning of a 70-year long humanitarian disaster for Palestinians which started with the expulsion of around 750,000 Palestinian Arabs from British Mandate Palestine by Israeli forces during the creation of the state of Israel. Since then Palestinians in the region have lived in an apartheid state and been denied basic human rights. After the demonstration at HSBC, the campaigners held a vigil outside the Central Library on St Peter’s Square. 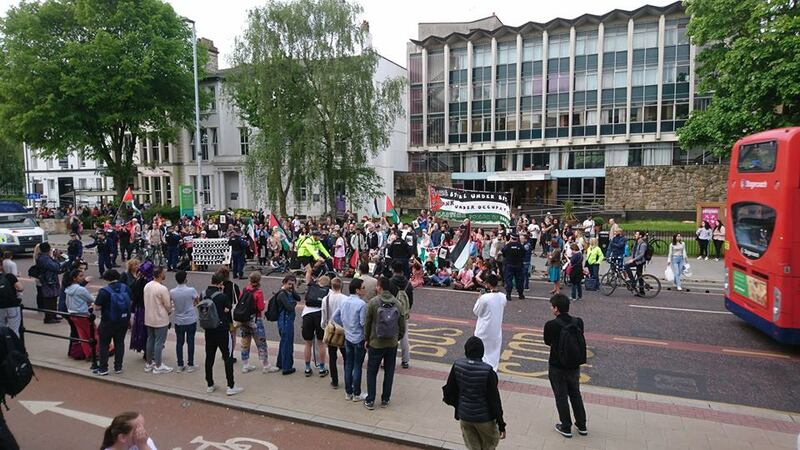 They then marched up Oxford Rd and held a sit-in outside the University of Manchester, where the names of the 58 Palestinians killed yesterday by Israeli snipers were read out. 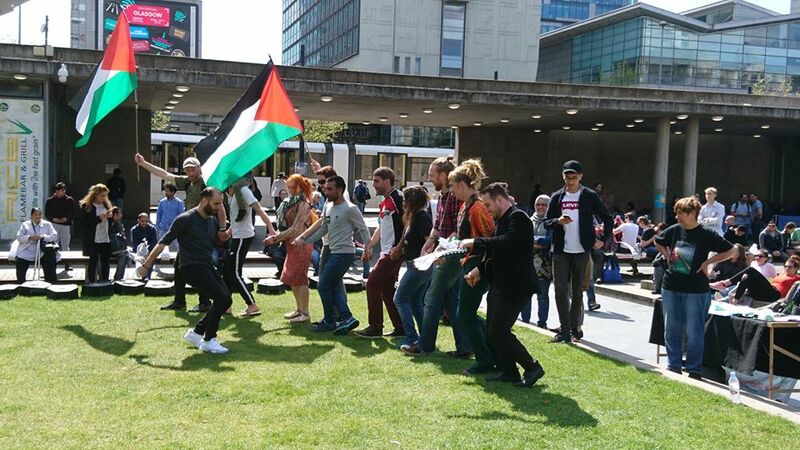 On the previous Saturday MPA had also set up a Nakba refugee camp on Piccadilly Gardens (below). 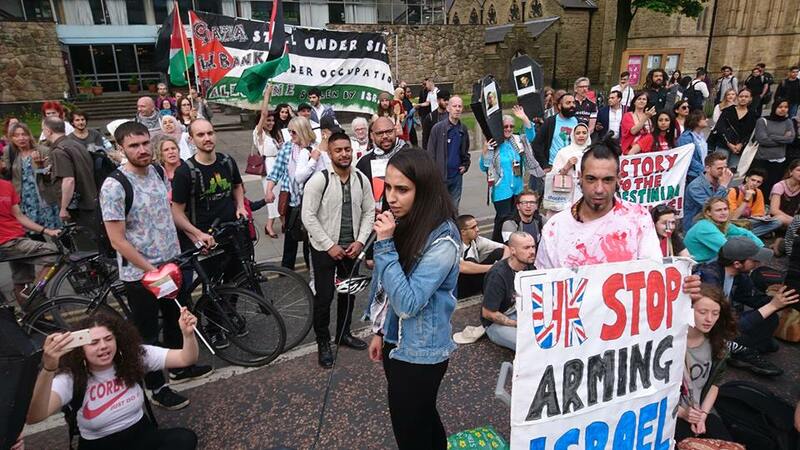 In 2017, HSBC held investments worth £832 million, with companies that provide equipment to the Israeli military, according to a report released by War On Want. 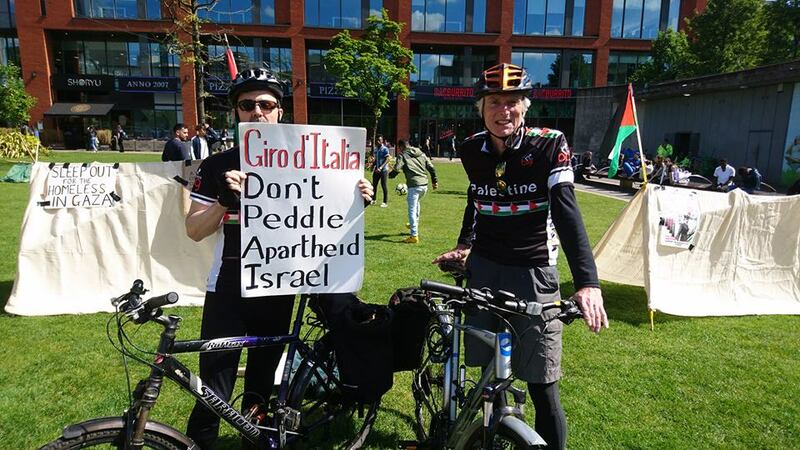 This included investments with Elbit Systems (£4 million) but also in other companies that profit significantly from selling equipment to the Israeli military: BAE (£181 million), Babcock (£27 million), Rolls Royce (£53 million) and Boeing (£102 million).